Laurent Patrick Fignon, born August 12, 1960, was a French thunderbolt in the 1980s, winning the Tour de France twice in a row as a young professional in 1983 and ’84. He closed out the decade winning Milan San-Remo back-to-back, in 1988 and ’89, the year he was more famous for losing the Tour by a mere eight seconds to American Greg LeMond than he was for being the last Frenchman to win the vaunted Giro d'Italia. He died of cancer age 50 in Paris on August 31, 2010, weeks after providing color commentary for the Tour, and sharing the podium with his former Renault-Elf teammate and nemesis Bernard Hinault. The sting of losing what reporters have called the greatest Tour in history stuck with Fignon for decades, despite his place among the Giants of the Road. "The morning after the defeat of the day before was when the hardest bit began," he wrote in his 2009 autobiography. "I kept counting in my head: eight seconds, eight seconds. And the more I counted, the more aware I became of what a derisory amount of time it was. You can't do anything in eight seconds! "How could I have lost? How could I have allowed it to happen? For hours and hours I felt sorry for myself. It was the only thing in my head. There was no flavour in anything I ate. Just moving felt like an effort. It was like being in a coma. 'Watch out for sorrow, it's a bad habit,' wrote Flaubert." 1. A late bloomer with cycling, Fignon switched from soccer at 15 and was told it was already too late to shine on the bike. 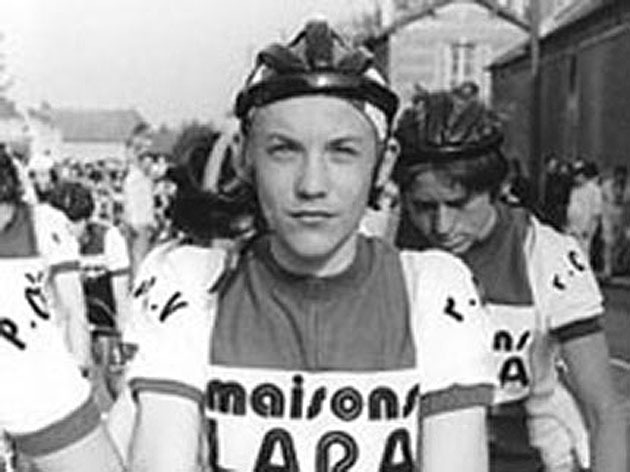 He proved everyone wrong, and by 17 won half the races he entered while racing for La Pédale de Combs-la-Ville. His parents, too, were against his determination to race. Young Fignon was forced to sneak to events behind their backs. His first race was held at Vigneux-sur-Seine, over 50 kilometers. Attacking late, he left the field of 60 far behind, winning by 45 seconds. His later teenage years were marked by similar successes. But by 1978, despite having no peers in his region, he still had little thought of riding professionally. He started 40 races, winning 18. He, like LeMond previously, eventually caught the attention of master tactician Cyrille Guimard, who guided Lucien Van Impe, then Hinault, to Tour glory. "Then (Guimard) turned up, very late, in a tracksuit, with a hazy look about him. He didn't say a lot, then got out the contracts. Of course neither of us took a second glance at what was written on them. We weren't going to argue with Guimard: he could have stipulated that we had to sleep in handcuffs and we'd still have signed. "We used our best joined-up handwriting and handed back the contracts, very pleased with ourselves. And he said emphatically: 'Well, you've just got your first thing wrong'. What on earth was he saying? He just amused himself by letting time tick on, keeping the suspense mounting. After a few lengthy minutes he explained: 'You've signed the contracts and handed them back but you haven't kept one. That's not how it's done.' He sounded as if he meant it but I gave as good as I got. 'But Monsieur Guimard, we gave them back because you haven't signed them yet. What's the point of us having a contract that hasn't got your signature on it?' He looked at me, amazed that I was so quick." 2. 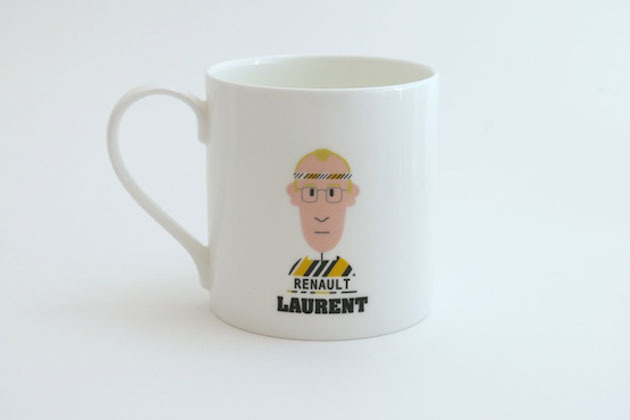 In 1983, Renault team leader Bernard Hinault was out of the Tour, recovering from surgery, so Guimard's tactical expertise was centered on his new French pupil, Fignon. In the 10th stage, race leader Pascal Simon crashed and broke his shoulder blade. Fignon was in second place, just 4 minutes, 30 seconds behind. Simon courageously continued, and only lost little time the next stages. In the 15th stage, a mountain time trial, Fignon was able to win back so much time that he was within one minute of Simon. In the 17th stage, Simon gave in to the pain and abandoned the race; Fignon became the new leader. In the next stages, the Frenchman was able to answer all attacks from his opponents. "Straight away, deep inside, I was convinced that I was going to win the Tour. It was so clear to me that I spoke about it to Pascal Jules. And the Tour kept going on its way, with Pascal Simon still there. All eyes were on him; all the photographers' lenses pointed at his shoulder. That suited me perfectly." After 3,809 kilometers and 22 stages, Fignon won the Tour by 4:04 over Spaniard Ángel Arroyo, taking the white jersey of the best young rider while winning the 50-kilometer time trial in Dijon on the second to last stage. At 22 years old, Fignon was the youngest man to win the Tour since 1933. He also joined the legion of honor: legends who won the Tour on their first attempt, including Fausto Coppi, Jacques Anquetil, Eddy Merckx and Hinault. "Even in 1984 I was not Bernard Hinault. Hinault was a better all-rounder, a better time triallist, better at hurting himself, and less susceptible to getting ill at the start of the season. I wasn't driven by the same forces. I didn't have pride like his, nor as uncompromising a personality. 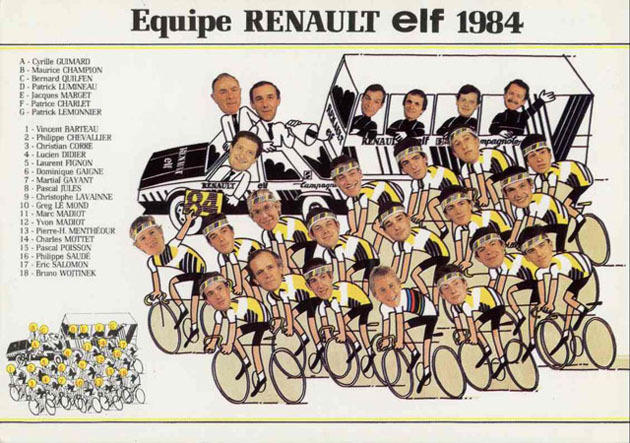 One thing must never be forgotten: I did not have the class that was Hinault's. To me, it was obvious, there was no question of it. "Dominating as I did in that 1984 Tour did not mean that I had lost my grip on reality, or zest for life and basic pleasures. On a bike, all facades gradually fade away. Stylistic effects don't last long. 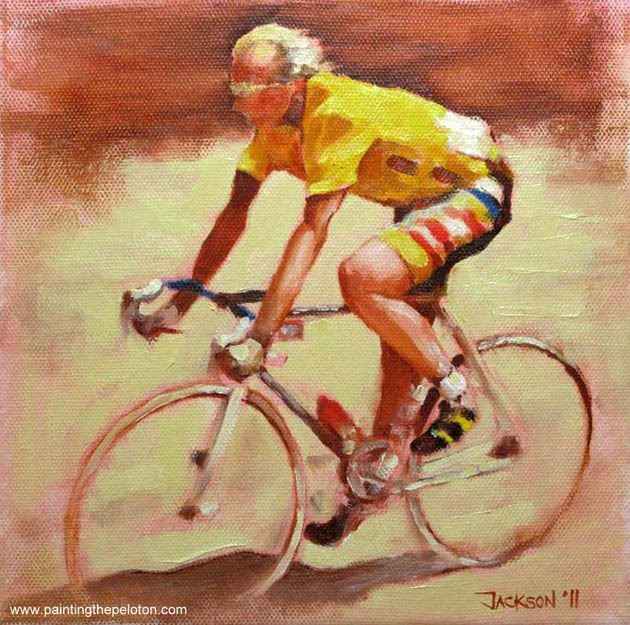 Cycling is the naked truth." 4. Not content with winning the 1988 Milan-San Remo by 20 meters ahead of young Italian upstart (and eventual world road champion several months later) Maurizio Fondriest, Fignon was determined to win the 1989 edition with no one else in the picture. "I knew that I had to avoid making the same move as in 1988. This time, no one was going to let me go anywhere on the Poggio. So I picked out another place to have a go, between the Cipressa and the Poggio. There, and nowhere else. The race panned out exactly as I needed it to. My legs didn't hurt; the pedals turned fluidly. I felt astonishingly calm. And when the Dutchman Frans Maassen, who had just won the Tour of Belgium, pulled out a 100-meter lead on the bunch, I didn't waste a second wondering whether I should go for it. It was done before I'd even thought about it. No one came up to us, and with more than 40 seconds lead on the bunch at the foot of the Poggio, I pushed up the pace on the hardest part of the climb. Maassen folded. "This time round, I was the only rider in the finish picture. It's hard to describe, but winning a Classic of this importance a second time was such a rare feat. I had to have total belief in the strength of my race knowledge and in my ability to focus completely on a single day." 5. The Giro d'Italia has had an almost eternal Italian flavor for decades, and it was rare for a non Italian to win the pink jersey and general classification (Swiss racer Hugo Koblet was the first foreigner to win it, in 1950). Fignon lost a nail biter to Italian demigod Francesco Moser in 1984, and was determined to prove he still had the minerals to win another Grand Tour in 1989. He was up against several near misses and debilitating injuries following his near-mythic double Tour salvo: a knee injury caused him to miss the 1985 Tour; in 1986, after Renault pulled out, Fignon and Guimard formed a then-revolutionary sponsorship arrangement to become owners of the team, with sponsors buying space on the jersey and equipment. They created the Système U cycling team; Fignon won La Flèche Wallonne and he entered the 1986 Tour de France, but placed poorly in the first individual time trial and retired on stage 12 to Pau. Fignon returned to near his full strengths in 1987, when he finished third in the Vuelta a España, behind Colombian Luis Herrera. Later that year, Fignon finished 7th overall in the Tour de France, taking another victory on Stage 21 at La Plagne. In 1988, Fignon had to abandon the Tour. He won the `89 Giro by 1:15 over Flavio Giupponi, while the `88 winner, American Andy Hampsten, finished third. For good measure, Fignon won the 220 kilometer Stage 20 jaunt from Voghera to La Spezia while in pink. "Along with Anquetil (1960, `64) and Bernard Hinault (`80, `82, `85), I was only the third Frenchman to win the Giro in cycling history—only three!—and I was the last to win it because none has managed it since," he wrote in 2009. "On the evening after I had won the race in Florence, Guimard came to have a word with me: he looked even more worried than usual. He wanted to talk one-on-one and it was important, even though all I was thinking about was celebrating my triumph. He was already concerned about July and looked me straight in the eyes: 'LeMond will be up there at the Tour'. I didn't hide my amazement. LeMond had been nowhere for the three weeks of the Giro but ended the race by taking second place in the final time trial. "We all know what happened in July 1989."